New England has seen little Amish settlement. Maine is the exception, with three small Amish communities as of 2010 (Young Center 2010). 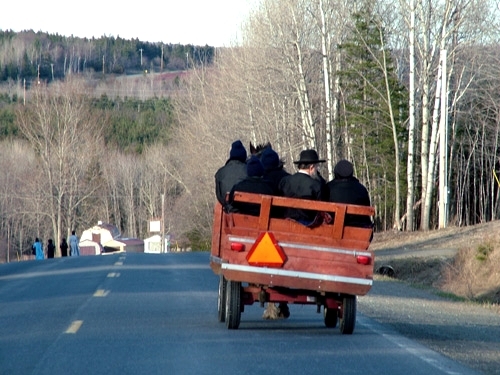 Amish can be found in two locations in Aroostook County–Smyrna and Fort Fairfield–and near the Waldo County town of Unity. The oldest Maine Amish community is located in Aroostook County near the town of Smyrna. This settlement was profiled in a piece in the Boston Globe in 2005. The town of Smyrna itself is described as a “rugged town of potato farmers and loggers, notable for its fierce winters and solitary general store” and “a remote place with little allure for outsiders.” (“Putting Down Roots: Amish find a home in rugged Maine”, Boston Globe, Sarah Schweitzer, February 2, 2005). However the area has held enough allure to keep Amish around, with families hailing from states as varied as Tennessee, Michigan, Iowa and Maryland making up the settlement. The community remains small at one congregation in size. In describing why they came to the area, an early settler explained: ”We wanted to be in an uncontaminated community”…”One less populated with plain people” (“Putting Down Roots”). The path this group took to being considered part of the Old Order Amish today is unusual. Individuals comprising a church somewhat like the Amish, but with key differences leaving them outside the Amish fold, first came to the Smyrna area in 1996. Following internal change, the group eventually did affiliate with the Old Order Amish in 2000, which may be considered the founding date for this settlement as an Amish community (personal correspondence Stephen Scott; see also Bryce Geiser, “The Christian Communities: A Brotherhood of Covenant and Commitment,” Old Order Notes, 321 Spring Summer 2000). Amish in Smyrna have created a range of businesses, which as of 2005-06 included greenhouses, a furniture shop, bicycle center, a horse breeder, as well as more traditional farms (read more on Maine Amish furniture). 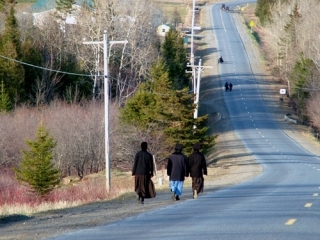 A second Maine Amish community can be found near the town of Fort Fairfield, also in Aroostook County. Karen Johnson-Weiner notes that a group of conservative “Joe Troyer” Swartzentruber Amish left the Heuvelton, NY Amish settlement in 2007 in order to found a settlement in Maine (see New York Amish, p. 60). Amishman Noah Yoder explained that he had spent 2 years searching for the “ideal place” to relocate. “What drew us to the area was the beautiful scenery, availability of farmland and some of the nicest people we’ve ever met. We’ve been well-accepted here and appreciate that.” (“Fort Fairfield and Easton Welcome Amish Families to Their Communities”, Fort Fairfield Journal, David Deschesne). The youngest community in Maine, at cheerily-named Unity in Waldo County, was founded in 2008. Some families arrived at this location from the settlement near the town of Smyrna in Aroostook County. Other areas contributing settlers included Amish settlements in Missouri and Kentucky. The Amish have cooperated with locals and have opened small businesses, including wood businesses and a farm stand featuring doughnuts one day a week. “We’ve been welcomed by the community. The community has been what we expected. They’ve welcomed us and helped us any way they can,” explained Ervin Hochstetler, Deacon of the Unity church. “Farmers have a lot in common, although our method of farming would be quite different than most farms.”(“Amish families reviving farms in Thorndike, Unity”, Bangor Daily News, Walter Griffin, October 23, 2009). Warm welcome for more Amish in Maine? Amish have generally found a warm welcome in Maine. Maine remains the only New England state with an Amish presence, however. Harsh climate and distance likely discourage Amish from settlement, but the relatively cheaper land prices and low population typical of the state are pluses for many Amish when considering a new location. If the current communities continue to show that New England can work for Amish, perhaps more will look North when considering new home locations in future. I am sorry Reggie but no can do on Trump. I do not want to see America turn into a dictatorship. I also support the rights of others. I can see from Trumps stand of Religious freedoms that as soon as he is done with Muslims, Hispanics, LGB, he will be after groups like our friends the Amish & Mennonites. Also as a woman I want to keep my rights and freedoms that we have worked so hard to gain over the years. You really need to read, “IT CAN’T HAPPEN HERE: WHAT WILL HAPPEN WHEN AMERICA HAS A DICTATOR?, by SINCLAIR LEWIS. It is like a prophecy of trumps coming. Further, I do not believe this is a site for political discussion. Leave that to Facebook and social media. Amen! Well said Natalie! There are plenty of sites on-line that will welcome political discussions. I am an American Painter of some renown. I am very interested in to know if there would be an Amish Community in Main where I might be able to live amongst, or at least visit and interact a number of days each week, for a period of a few months, preferably in the summer. I am also willing to work a couple of days a week in whatever capacity needed, to broaden my experience. I wish to do a whole series of paintings about the people, their culture, and my experiences there. I am respectful, and willing to abide by any rules or requirements set forth by the community, and would welcome any suggestions. I thought it was strange to see a blog about the Amish. They don’t have computers! So who is running this blog? I am a 59 year old nurse thinking about joining an Amish community. I live in Massachusetts so Maine is the closest. I am a born again Christian so I am accustomed to their beliefs and baptism. I got baptized in 2010. Not sure about speaking German though. They live in America, they may be Amish but they are also Americans. Americans speak English. I’m not willing to do otherwise. It’s a patriotic thing I have. I believe in having ancestry, that’s important. But when you decide to live in America, you speak American. I was born here and I will die here and I will speak English. They don’t talk much about healthcare except that they take trips to the hospital. I am a nurse of 38 years. Can’t I work for them and take care of them as a nurse? I also cook and bake. I am wondering what restrictions they have on ingredients other than alcohol of course. So… you are thinking about joining the Amish but have already decided a large part of the culture – the language – is not going to work for you. (And Americans DO speak many languages, or are you saying immigrants who don’t immediately drop their language are not really Americans? That could really open up a can of worms and start a discussion on America’s history.) Anyhow, so in deciding you won’t speak German because of your patriotic beliefs you are not going to read the history & religious writings, understand sermons or hymns, converse with children who might not yet know English, or grasp all of the casual conversations going on around you? Joining another culture can be challenging enough — doing so while choosing to isolate yourself linguistically is almost impossible. Americans speak English? I do, but I also speak another language. I am born & raised here and expect to die here, but I also appreciate my heritage and culture! What a puzzling attitude for someone wishing to become Amish. I’m starting to get why the Amish are wary of people who want to join them out of the blue. Too many people see Amish as a fad, they do not realize the hard work and dedication it takes to be one of these very unique people. It is saddens me to see this sort of thing. Being Amish takes a very special person. It appears to me, reading your statement that you are chasing a dream and not committed to the cause. You are seeking a slower quieter world, not the hard and dedicated life of the Amish. Amish do not get involved in politics, do not show patriotism, or practice the Christianity you are “born again” to. You do more than bake and cook, you will be growing food-animals and you don’t go to the store when you need meat or veggie. You will be sewing your own clothes. Laundry is done with homemade soap and if you are lucky with a ringer washer run on a generator. Your walls will be barren of photos art or decorations. You will heat with wood that YOU carry in after cutting and splitting. You cook on a wood stove. The language is an important part of the community and heritage. I would say, reading what you posted you are more set to be an off girder than a member of the Amish community. As far as being a nurse, yes it maybe helpful however Amish are strongly natural-herbal medicine. Minimal encounters with modern medicine. I hope this will help you in your decision. FYI, we have been close friends with several Amish families for years and am sharing this info with you based on our knowledge of these fascinating and loving people. You “speak American”? So what Native American language do uou speak? English is from England, a bunch of immigrants Christine. The reason you don’t want to speak another language is not a “patriotic thing”, rather it is a “lazy thing”. We have a community of Amish living in Brownington Vermont for the pass few years. It would be closer then Maine for you. Would this mean that it would be possible to live/work amoungst your community in the future for reference information for my artwork??? Interested. If you want to become Amish then it is 100%, you adapt to their culture and not that they adapt to what you want them to be. I Respect the Amish very much what they do (culturally, tradition, Faith, their inventiveness and etc). Because of my respect to the Amish, I have never asked them if I could join them! The more Languages you know the better. In the German speaking part of Switzerland the Dialects is the Spoken Language and High German is learned in School so is French, Italian, or Raetoromanisch (which is a descendant of the spoken Latin Language and it is spoken in parts of the Canton of Grisons or in german Graubuenden). And when I came to North America I learned English. Pennylvannia Deutsch is an American Language same as French is for Quebec Canada or Spanish for some parts of the US. Very well said, Urs. your first paragraph is quote-worthy! Does the Amish Community offer cooking class's? Do any one in the Amish Community offer cooking classes? I personally would love to try my hand at a few dishes? Hi: So there are two other newer communities here in Maine that I know of: One in Smithfield which are Black Top Amish, and one in Whitefield which is older and bigger. Wiscasset. They also sell fresh breaf and other lovely things made on site at the farm. It’s a lovely ride on a bright sunny Saturday to check out these places and meet our newest Whitefield Amish farmers. am a writer currently engaged in preliminary research for a book about eating and appetite, and the impact that particular circumstances- spiritual, physiological, situational and geographical- have on cooking and eating, both for the individual and community. One of the chapters will focus on spiritual and religious communities and I wondered if it might be possible to be put into contact with representatives of the Amish communities in various states for the purpose of eventually interviewing them/spending time locally. I would also love to talk to any member of the Amish or Mennonnite community about their cooking, growing and eating lives and I have included my email below. I will also be talking to Muslim food writers and chefs about Ramadan and how they cope when their careers are so food-focused and people who have converted to Judaism, exploring how illnesses such as diabetes affect participation in rituals of fasting and feasting.